If you're the type of pickle-loving fiend who would happily tote around a jar of dill spears to snack on all day if only it weren't so messy and frowned upon to do so, well, today is a good day. Vlasic is making a whole new type of crunchy, snackable "pickle chip," and they're made using actual pickles. 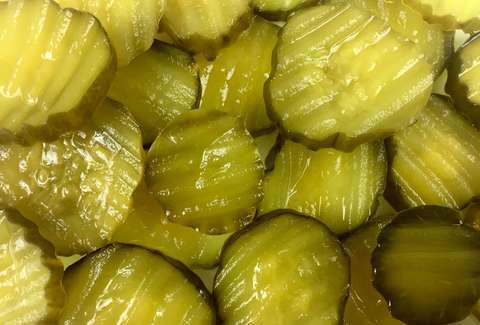 The new crispy pickle chips are part of a new slate of snacks set to be launched by Conagra, which owns Vlasic and a whole bunch of other brands, per a report from Food Business News. The chips, which, to be clear, will be dry and come in single serving bags -- are different from many other pickle-flavored products that have flooded the market in recent years, mostly because they're made from the real thing. Specifically, the chips are essentially just vacuum fried, thinly sliced dill pickles that have been rendered into crunchy wafers with the sort of punch of salt and vinegar that you'd typically only get from a juicy brined cucumber (sorry, Lay's). Thrillist has not yet had a chance to taste the new chips since they're still in development, but the concept of a mess-free grab-and-go version of the Vlasic classic is more than enticing. Unfortunately, there also aren't any specific details on when they may hit shelves. We're keeping our fingers crossed they'll be around in time for summer, though, because the thought of a freshly grilled burger topped with a pickle-chip hybrid is already making us hungry for BBQ season. Then again, so is the prospect of a bread-less pickle bun.